What Type of Radiation Therapy is SBRT, SABR and SRS? Stereotactic body radiation therapy (SBRT) – also known as stereotactic ablative radiotherapy (SABR) – and stereotactic radiosurgery (SRS) are the most advanced forms of radiation therapy for cancer treatments, offering the ability to deliver high doses of radiation with extreme precision. SBRT and SABR are commonly used for treating tumors throughout the body, while SRS is typically used to describe treatments specific to the brain. The CyberKnife System is ideally designed for SBRT, SABR and SRS. It has a flexible robotic arm that can move to virtually any angle around the patient to deliver radiation to a tumor. 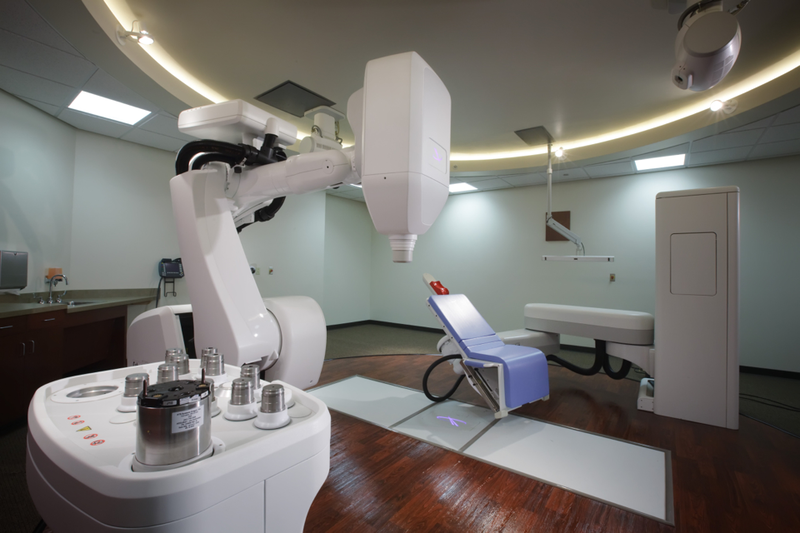 The CyberKnife System also integrates image guidance and tumor tracking technology, which enables it to adapt to the motion of the tumor and correct and verify in real-time the location of the tumor to ensure radiation is focused on the tumor and not the healthy surrounding tissues and organs. With these unique imaging and motion tracking capabilities, the CyberKnife System overcomes many of the challenges of conventional radiation therapy. Patients are not required to have restrictive and uncomfortable frames bolted to their heads, or rely on breath holding or gating techniques designed to keep individuals as still as possible during treatment. Instead, CyberKnife patients can lie comfortably on the treatment couch for their non-invasive treatment, and be confident that the radiation is being delivered directly to their tumor and be confident that side effects are being minimized as a result of that precision. SBRT, SABR and SRS technique differs from conventional radiation treatments – such as IMRT, IGRT and proton therapy, which involve exposing large areas of a patient’s body to relatively broad fields of radiation over a long period of time, often 35 or more consecutive days of treatments. With CyberKnife SBRT, SABR or SRS treatments, patients typically undergo daily treatments for five days or fewer.